Welcome to our free PHP tutorial. This tutorial is based on Webucator's Introduction to PHP Training course. A common way to pass data from one page to another is through HTML forms. There are two methods of submitting data through a form: the get method and the post method. In this lesson, you will learn to use both. To process form data with PHP. A common way to pass data from one page to another is through HTML forms. There are two methods of submitting data through a form: the get method and the post method. The method used is determined by the value of the method attribute of the form tag. The default method is get. When the get method is used, data is sent to the server in name-value pairs as part of the query string. The get method is most commonly used by search pages and is useful when it is important to be able to bookmark the resulting page (i.e, the page that is returned after the form is submitted). Navigate to http://localhost:8888/Webucator/php/Forms/Demos/ in Google Chrome. Open Chrome DevTools and make sure the Network tab is selected. 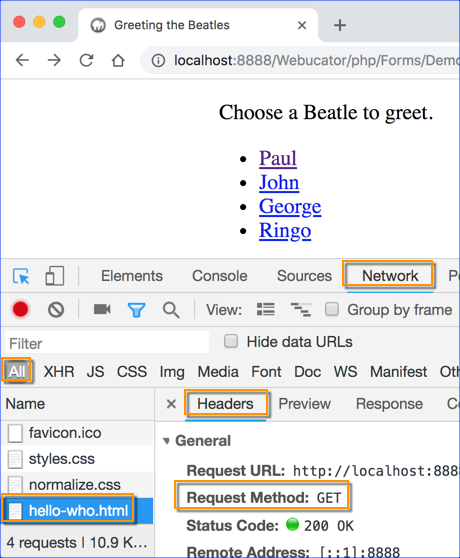 In the bottom left of DevTools, click on hello-who.html and look at the Headers on the right side: Notice the Request Method is GET. 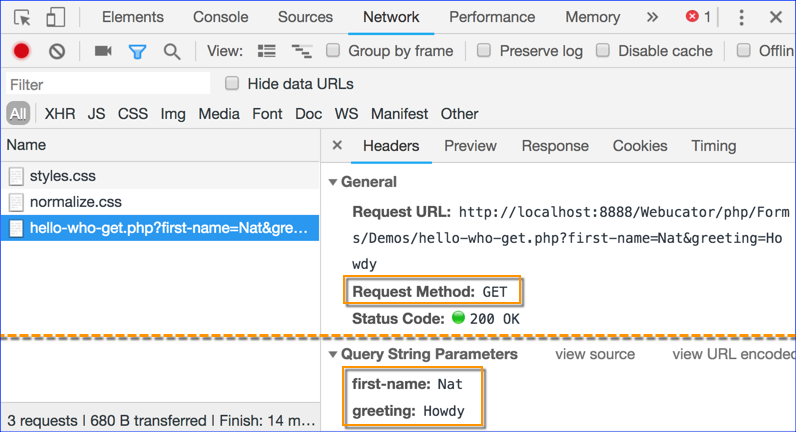 As we have already seen, we can access those parameters in PHP with $_GET['beatle'] and $_GET['greeting']. Notice that the form uses the get method. Navigate to http://localhost:8888/Webucator/php/Forms/Demos/hello-who-get.html in Google Chrome. 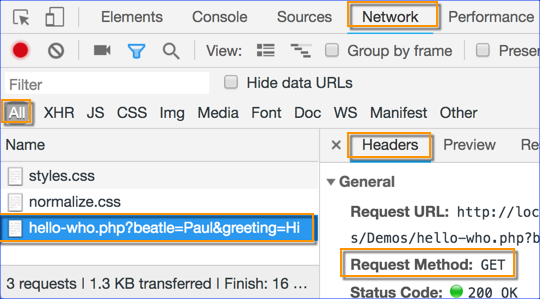 Make sure Chrome DevTools is open to the Network tab. And that is why these pages are bookmarkable and shareable. 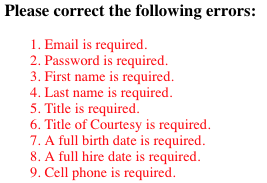 The only difference between this form and the last one is that this one uses the post method. Navigate to http://localhost:8888/Webucator/php/Forms/Demos/hello-who-post.html in Google Chrome. The name-value pairs are not visible in the location bar, so sensitive data such as passwords are not displayed on the screen. Files, such as images and Office documents, can be uploaded via the form. The major disadvantage is that the resulting page cannot be bookmarked. As a general rule, you should use post unless you want the user to be able to bookmark or share (e.g., via email) the resulting web page. If you have used Node, you might be used to a routing system that doesn't have a one-to-one relationship between files and URLs (not including the query string). For example, you might navigate to http://localhost:8080/hello-world.html and see a web page, even though there is no hello-world.html file on the server. Likewise, you could have a form that submits to "/process", without any corresponding file named process on the server. While it's possible to set your web server up to behave in a similar way for sites running on PHP, it is not the norm. 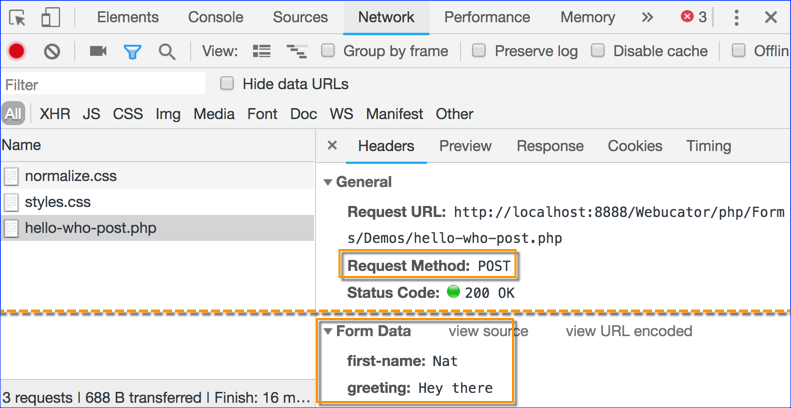 Typically, with sites running PHP, when you make requests for pages (e.g., hello-world.html or process.php), there are actual files with those names on the server. The table below describes how data from different types of form fields are sent to the server when a form is submitted. Note that the table assumes that all the fields are enabled. Disabled form fields will not get sent to the server. text-like and textarea Always sent. If left blank, an empty string is sent. radio buttons Only sent if a selection is made. checkbox If checked, the default value of "on" is sent unless otherwise set in the HTML. If not checked, variable is not sent. submit button This applies to both input elements of type submit and button elements of type submit (the default). If a submit button has a name, it will be sent along with its value. Note that if there are multiple submit buttons, only the one that is clicked will get sent. If the user submits the form by pressing the Enter key while focus is on a text-like field, the first submit button in the form will be used to submit the form. When form data is submitted, the data needs to be sanitized (cleaned). This way, if the user enters ' Bruce ' with spaces before and after the name, $firstName will get 'Bruce' without the spaces. Enter a search query and press SEARCH. That looks fine. Now enter x" onfocus="alert(1) like this: And press SEARCH. The filter_var() function is used to sanitize and validate data. There are many built-in constants for sanitizing and validating different types of data. For making strings safe to output to the browser, the most useful of these is FILTER_SANITIZE_STRING. Note that this will completely remove less than and greater than signs, which may or may not be what you want. The filter_input() function is similar to filter_var(), but it is specifically used with the built-in superglobals, most commonly with $_GET and $_POST. For example, the code below would assign a sanitized value of $_GET['q'] to $q. Like filter_var(), this will completely remove less than and greater than signs, which may or may not be what you want. Unlike filter_var(), if q does not exist in the $_GET array, filter_input() will not generate a notice. Instead it will return NULL, which conveniently converts to an empty string when treated as a string. Was the Field Filled In? Often you will simply want to validate that the user entered a value. There are a variety of ways to do this. Notice that this uses the null coalescing operator (??) to assign an empty string to $f['q'] if $_POST['q'] does not exist. Is the Entered Value an Integer? In addition to sanitizing data the filter_var() and filter_input() functions can validate data using the FILTER_VALIDATE constants. Both functions will return false if the validation fails and will return the filtered value of the variable if it succeeds. The FILTER_VALIDATE_INT filter will check to see if the variable represents an integer (e.g., "1", which is a string, but can be converted to an integer). If it does represent an integer, it will convert the value to an integer type and return it. If it is not an integer, it will return false, which, like NULL, conveniently converts to an empty string when treated as a string. See https://www.php.net/is_int for details on the is_int() function. Is it a Valid Password and Do the Passwords Match? You should not trim or filter passwords. You should use exactly what the user entered. And, for security reasons, you should never return the password to the browser. Do the Combined Values Create a Valid Date? Did the User Check the Box? We review the solution to this exercise over several videos. If you have trouble, you can rate the exercise to move on to the next presentation, watch the video explanation, and then come back to the exercise to continue your work. <input name="birth-day" type="number" min="1" max="31"
<input name="hire-day" type="number" min="1" max="31"
Visit http://localhost:8888/Webucator/php/Forms/Exercises/add-employee.php to see the page. 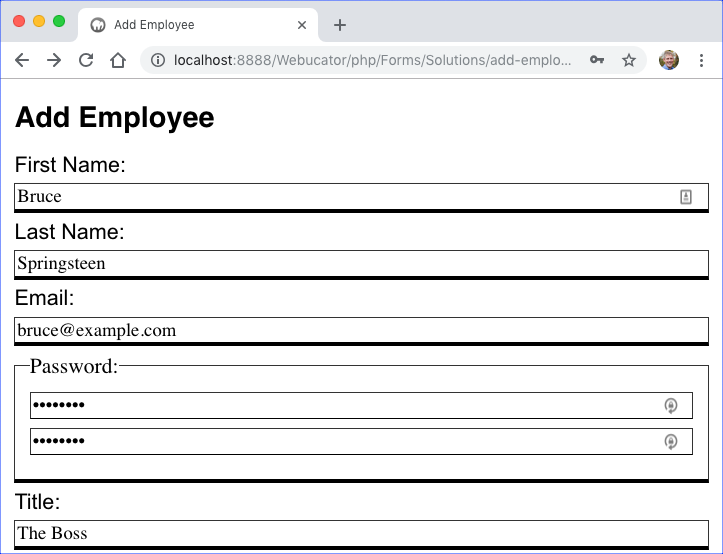 Open Forms/Exercises/add-employee.php in your editor. Below the declaration of $courtesyTitles, declare $f and assign it an empty array. This will hold our cleaned-up form variables. If the form has been submitted, add-employee (the name of the submit button) will be present in the $_POST array. Write an if condition to check for this. Within this if block, you'll do your form validation. Add code to check that the birth date and hire date fields are all filled out and create valid dates. 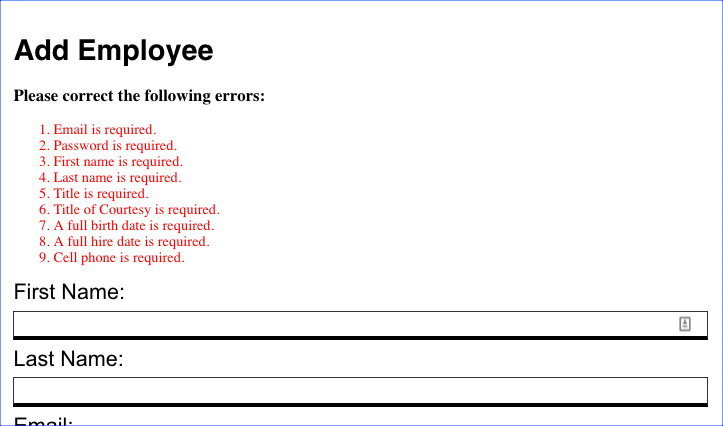 Below the "Add Employee" h1 element, create a PHP block. If there are no errors and the form has been submitted, output <h3>Form Data</h3> followed by an ordered list of the data: We would normally insert the data into a database, but for our purposes right now displaying the data in the browser is enough. 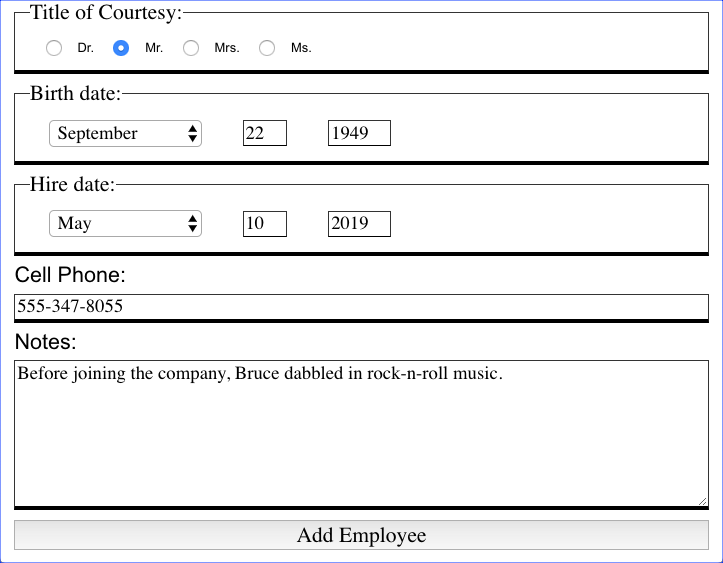 Add code to the for loops for the select menus (using the selected attribute) and radio buttons (using the checked attribute) to "remember" values submitted through the form. Submit it without entering any data. Submit it with invalid data (e.g., an invalid email address, passwords that are too short or don't match, a date that isn't real like February 31). Submit it with valid data. // but we will just show the form data. echo '<li><strong>Name:</strong> ' . $f['courtesy-title'] . echo '<li><strong>Cell phone:</strong> ' . There is a significant amount of code here. If you're having trouble understanding any of it, go back through the exercise instructions slowly and methodically, matching each instruction with the relevant code in the solution. Then watch the video that follows.